If you’re feeling overwhelmed by your email inbox, you’re not alone. At the risk of sounding like “Debbie Downer,” email volume is only going to get worse. Luckily, it’s National Clean out Your Inbox Week – a time to get my inbox on the radar and start the year with a fresh slate. According to the 2015 – 2019 Email Statistics Report by The Radicati Group, in 2015, the number of emails sent and received per day (worldwide) total over 205 billion. The report predicts this figure will grow at an average annual rate of 3 percent over the next four years, reaching over 246 billion by the end of 2019. So what does this mean to people in the business world, who like me, utilize email as the “go-to” form of communication? In order to solve my little “email hoarding problem,” (21,000 in inbox and 24,000 in sent – but who’s counting) I’m taking full advantage of National Clean out Your Inbox Week. Follow this simple checklist to make your email more manageable. If you delete 30 to 50 emails a day, you’ll be well on your way to a shiny new inbox. Let National Clean out Your Inbox Week motivate you, too! 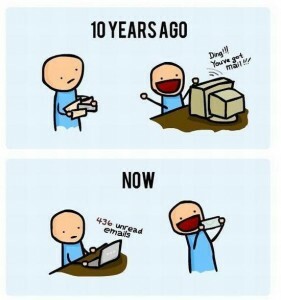 If you have any tips on how to improve your email habits, please share.